Kol Nidre… at Old St. Patrick’s Church? It was a Sunday Mass at Old St. Pat’s. The city’s oldest public building (it survived the Chicago Fire), this downtown Chicago Roman Catholic Church has a 160-year history of hospitality, welcoming generations of immigrants from Ireland and elsewhere. Today its diverse parishioners come from over 200 zip codes. And for almost 30 years, Old St. Pat’s has welcomed interfaith families. As always, worship began with the penitential rite, a shared meditative moment of confession. But this time, the music heard was Kol Nidre. 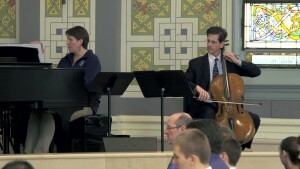 We captured this remarkable event in our newest Leaps of Faiths video. This project is a true “Leap” for us – we’re creating a documentary about interfaith families, the choices they make, and their hopes for their kids and their spiritual lives together. Our film will respect any choice a family makes regarding their home and religious life, while taking a closer look at what happens for those who decide to “do both.” Over a generation, we’ve seen they can raise children who grow up far from confused; indeed many often develop deep connections to one or both faith traditions. St. Pat’s has become a spiritual home to many of them: a Catholic community where Judaism is valued and honored, liturgically and educationally. Much of our footage is from the Chicago Interfaith Family School, hosted by St. Pat’s and run by interfaith families whose children grow though grades K-8 learning both faiths, taught by their parents. These are the kinds of questions we’ll raise in the film. We hope you’ll enjoy this video and the others here on our website – please share them with friends. If you like our facebook page, or subscribe to our youtube channel, you’ll get word of new videos as we release them. And if you would consider donating to help make the dream of this project a reality, we would love to add your name to our growing list of supporters. In this season of Thanksgiving, we are profoundly grateful for all the support we have received, and look forward to telling the kinds of stories so many of us share. Author David KovacsPosted on November 23, 2016 November 24, 2016 Format LinkLeave a comment on Kol Nidre… at Old St. Patrick’s Church? It’s a Leap for us, too. But it’s a story that’s bigger than the Family School alone. At its heart, it’s about couples… wrestling with all kinds of decisions whenever they fall in love, think about marriage, and wonder if their differences (religious and possibly also cultural, racial, or gender-based) should hold them back. Those of us who are further along on the journey have all been there. We heard the dire warnings that our marriages were more likely to fail. We wondered about raising kids primarily in one faith, or should we try to do both? We’ve seen possibilities on all the different paths, and how joyous the outcomes can be. We’ve seen how looking at the world through different religious lenses heightens understanding – not just between faiths, but also between partners. And we’ve seen how the dialogue can break down walls of old misunderstandings to build bridges of new possibilities. Most importantly, we don’t believe the conventional wisdom is necessarily true. Interfaith marriages – however the family system evolves – absolutely can work. We were excited about the compelling videos we’d already produced – but how could we build on them? We approached WTTW – PBS here in Chicago – and things ramped up when they said they would air the program if we could produce it. Where to start? We figured it would cost us at least $3,000 to create the trailer and website you see here, and we had already put in our own money and time so far. We turned for help from our Family School community – current and alumni families. Their response was amazing. In less than three weeks, 32 families and individuals had contributed over $3500. Folks volunteered their time to help with legal, graphic design, marketing ideas and more. Sarah Patt, a Family School graduate and high school junior shot some beautiful video footage that enhanced what we were shooting professionally. We plunged in – met even more people and interviewed them – and the result is what you see here. The trailer is just a sample of what we have to share, and we look forward to posting new videos on many dimensions of interfaith life regularly on this site as we welcome many more folks to support this project. Our goal is to help people know that if they – or a friend or family member — want to take their own Leap of Faith, there’s a lot of support out there to help them. We are so grateful for all the people who have joined us so far and we can’t wait to see what’s next in this exciting journey – stay tuned! Author adminPosted on April 7, 2016 April 11, 2016 Format LinkLeave a comment on Why Leaps of Faiths?